Recreation Department and Friends of Grand Rapids Parks. 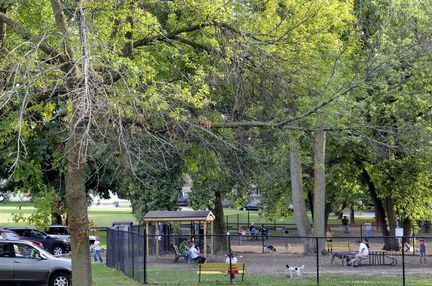 GRAND RAPIDS — Thanks to a $10,000 grant, trees will be celebrated and planted next month as part of “NeighborWoods” activities hosted by the city and the Friends of Grand Rapids Parks. trees, whose trunks will have diameters between 2 and 2 1/2 inches. surviving, said Steve Faber, director of Friends of Grand Rapids Parks. Southeast Michigan and is taking hold in West Michigan. as the nation’s most sustainable mid-sized city by Siemens and the U.S.
Chamber of Commerce Business Civic Leadership Center. the Coit Avenue bridge over I-196 on Oct. 30. Oct. 9: Oakdale Neighbors and Art of the Table will host a “Nuts and Berries Bike Tour” of the city. The tour will begin at 3 p.m.
be held from 9 a.m. until noon. begin at 11 a.m. at the Lagoon Shelter near the center of the park. “Trees, Treats and Tombstones” tour of Oakhill Cemetery, 647 Hall St. SE. The event will begin at 3 p.m.